The read-write matrix provides a model for analysing the roles of learners in working with documents in a Web 2.0 context. The complexity of Web 2.0 tools, however, has prompted me to explore ways of extending the model to provide more detail, including different forms of contribution and collaboration. In addition, some readers have found the two-dimensional matrix difficult to interpret. I’ve been wondering for some time how to show additional dimensions to the read-write matrix. This is necessary because it’s helpful to distinguish between different sorts of editing rights. For example, the blog reader cannot usually edit someone else’s blog posting but can normally add comments to it. We can use such a table to define clearly how we might want a specific wiki or blog activity set up for a learning activity, and we can use it to communicate to teachers and/or students how an activity is meant to work. A simple tick or cross in a cell shows that that user type has that role. We could easily extend either version to include the additional user types in the read-write matrix: the sub-group of peers and the wider group of a learning community. We could also add other types of contribution in addition to commenting and editing: eg annotation or bookmarking. In addition, I envisage simple planning tools which incorporate something like table 1 to help communicate decisions around educational use of Web 2.0 tools to other teachers, technical support staff and learners. The table extends the read-write matrix by adding detail to the types of collaborative contribution, but also provides a simple means of communicating the analysis to others. 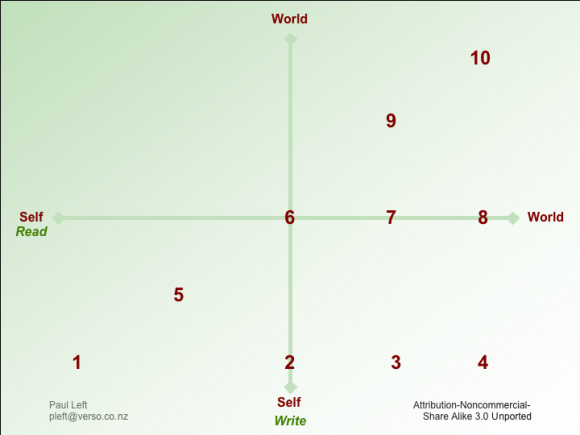 This entry was posted in Pedagogy, Professional development, Tools and tagged blog in education, read-write matrix, web 2.0 tools for learning, wiki in education on May 13, 2008 by Paul Left.